Our expertise in the LNG industry is based on the more than 45 years of technical advice that we have provided for gas liquefaction plants around the world – including the world’s first commercial plant, which came on-stream in 1964 in Algeria. LNG is fast becoming a truly global commodity and will continue its rapid expansion in the years ahead, with global demand potentially doubling to 400 mtpa by 2020 and 500 mtpa by 2025. This will be driven by the growing gas import needs of China, India, the Middle East and Europe – but also by new importers such as Malaysia, the Philippines, Singapore, Thailand and Vietnam. 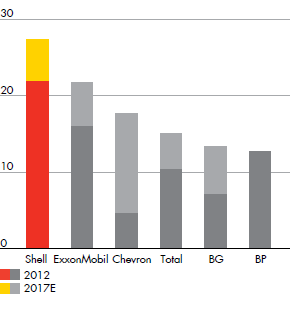 At Shell, we are proud of our leadership in this sector of the industry. 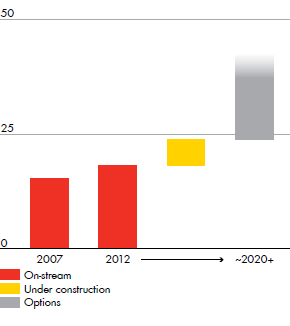 In 2012, ventures in which Shell participated supplied as much as 35% of global LNG. We have about 22 mtpa of Shell-share liquefaction capacity currently in operation in Australia, Brunei, Malaysia, Nigeria, Oman, Qatar and Russia. Qatargas 4, a joint venture between Qatar Petroleum (70%) and Shell (30%), was brought on-stream in early 2011 with a single mega-train delivering approximately 7.8 mtpa of LNG and a peak production of 280 thousand boe/d. The project opened up new markets for Qatari LNG in China and Dubai, with agreements signed in 2008. Our total LNG sales volume in 2012 was 20.2 million tonnes – up 7% from 2011. This increase mainly reflected the increase in sales volumes from Qatargas 4 and the Pluto LNG Project. Sales volumes were also higher from Nigeria LNG, helped by a stable gas supply, and from the Sakhalin-2 project, where production exceeded 10 mtpa. Three LNG projects are currently under construction in Australia, with capacity totalling about 7 mtpa: Prelude FLNG (Shell interest 67.5%), Gorgon Trains 1-3 (25%) and Wheatstone (6.4%). We are also assessing additional future options with more than 20 mtpa of capacity, with projects involving: Arrow Energy; Gorgon Train 4; the Browse and Greater Sunrise fields offshore Australia; the Abadi field of Indonesia; and LNG Canada. In February 2013, Shell agreed to acquire part of Repsol S.A.’s LNG portfolio, including supply positions in Peru and Trinidad & Tobago, for a cash consideration of $4.4 billion. Shell will also assume and consolidate $1.8 billion of balance sheet liabilities predominantly reflecting leases for LNG ship charters. Includes feedgas from non-integrated ventures. Projects in operation or under construction.